In fact, these two things were the subjects of two of my very first attempts to create a CG shot, back in 1995. So, going back to them two decades later has indeed triggered a few moments of nostalgia. To make the whole thing even more surreal, I can reveal that the space ship I did create together with my very good friend Emanuele Salvucci back in the days was also named ‘Avalon’, as it’s the one on this show. Although the model created by our asset department was incredibly complex and articulated, some shots required extra details and our team helped with that. Avalon Interior Animal Bay // Look developed through rebalancing of multi channel renders (AoVs) and DMP projections in Nuke. The look of this one-off shot went through some iterations. A few concepts were made and then the whole ‘Animal Bay’ was modelled and rendered, however, just a few weeks from the final delivery, the supervisor wanted to explore more options and I was tasked with creating a new version of it. I’ve started gathering all the separated layers rendered in Nuke and then I’ve rebuilt the final result changing the intensity and colours of lights, as well as projecting some extra textures and changing the material response through some heavy roto and ID driven grading. It occurred to me that in order to create a more atmospheric look that emphasise the scale of the bay, I could have played with a dark environment, in which only the areas where the humans operate fully lights up and everything else is counterpointed by an infinite amount of faint small lights from the animal tanks and their monitors. This allowed me to add some extra life into the shot as the environment lighting evolves according to the position of Jim Preston‘s car. I gave the final touches adding some dry ice smoke elements, making sure that they reacted to the surrounding volumes and lights in a believable way. Luckily, I could also rely on the help of the lovely and talented Eva Kristjáns, which produced the DMP layers representing the animals inside the cryogenic tanks with impeccable care. Space Environment // A small crop of the fully ‘immersive’ Space environment created for the film with its final blue grading. I don’t know how much of that is obvious to the audience, but The Space Environment setup for this show has been a real labour of love. The first time I have created a setup for a space shot it was back in my Lightwave (5.6) days. It must have been 1995, when my childhood friend Alberto Gelpi and I created a flight through a nebula with a very limited tool set and ridiculously slim computational resources (by today’s standards). This time a little army of artists*, including my self, spent time painting or extracting nebulas and other photographic elements from hi-res Nasa (CC) photography. All these elements became the raw material on which (the always amazing) Jules Bodenstein and I based a massive nuke script that simulated a ‘volumetric’ recreation of the space around the Avalon. The pre-requisites of the setup, were that it had to be flexible and heavily art-directable at any moment in time (including the very last Compositing stage) and it had to allow for very smooth and deep parallax. Moreover, the stars had to be recreated to serve any possible shot and hence their look had to be consistent from very wide to very long lenses and hence we had to take in account the way stars are optically captured and represented by photography. This seems a trivial problem but sampling super bright objects less than a pixel wide offered a number of challenges and contributed toward the most complex and heavy Nuke scripts I have ever seen. In this huge technical and logistical endeavor I was lucky enough to gain the supervisors trust and hence I was given the opportunity to steer/design the look of two (out of the three) setups used for the entire show. *As usual, I feel it’s important to not forget the precious contribution of my friends and colleagues: Danny Geurtsen, Jacek Pilarski, Marco Rolandi, Ed Babb and Jules Bodenstein which provided very good raw elements I could play with and support throughout the process. Space Environment // A very small details of the fully ‘immersive’ Space environment, presented in it’s original colours, with different exposures to show the dynamic range and latitude available in our setup. We called this side ‘North’ and it’s the direction toward which the space ship is travelling. In the final comps the whole palette is shifted toward a blue tint. Space Environment // A few details of the fully ‘immersive’ Space environment, before the final blue grading, featuring some dark dust formations. 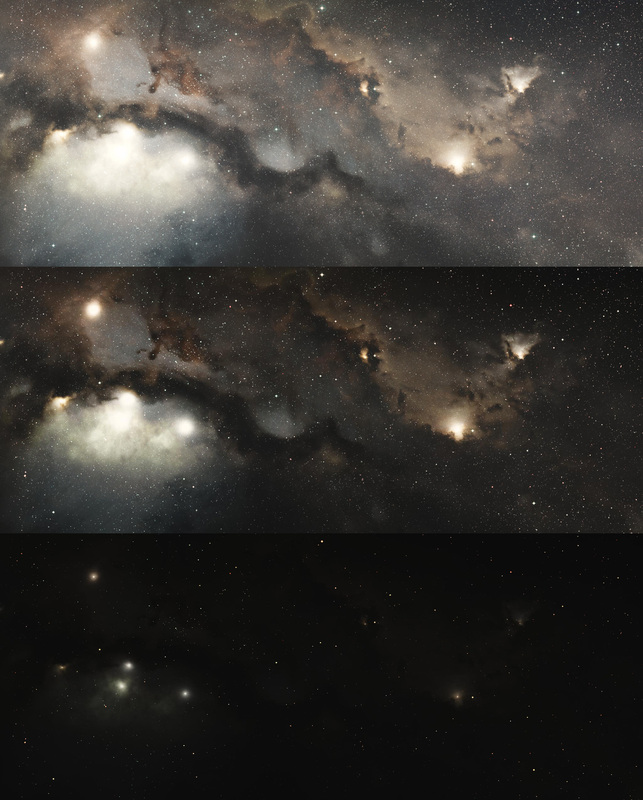 Space Environment // A few details of the fully ‘immersive’ Space environment, featuring some dark dust formations, after the final blue grading. Space Environment Concept // Early concept. Surprisingly, throughout the show production we found our selves trying different ideas and then going back, over and over again, to this very early concept that I’ve quickly made in Nuke. This used a few Nuke particle systems combined with several fluid shapes, some of which had been extracted from Nasa photographs by other team members.